You don't have to outrun the dragon. You just have to outrun your friends! The dragon, Drakon, has captured a band of heroes who were trying to sneak into her lair. Instead of eating them immediately, Drakon has decided to play a game with her prisoners: the first hero to collect 10 gold from Drakon's hoard will be set free. The rest will be lunch. As one of the captured heroes, you must race through Drakon's magical maze collecting gold and thwarting your opponents' moves with trickery and well-placed traps. 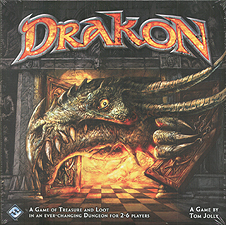 Drakon is a fast-paced game of chases, tricks, and traps for 2-6 players, playable in 20-60 minutes. This edition of the game features chamber tiles with new art and graphics, new plastic hero sculpts, and new hero reference cards.